The sculpture that I have been working on for the past few weeks is nearing completion. 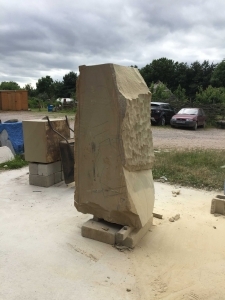 The Woodkirk sandstone piece is destined for the Derbyshire village of Hatton where a sculpture trail will depict some of the industries that have influenced the development of the village. The sculpture that I have been working on relates to the early days of the Nestle factory. Today, Nestle are synonymous with coffee and the factory is the home to the popular Dolce Gusto capsules. 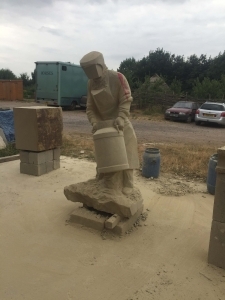 The sculpture though takes us back to the infancy of the factory in 1901 when local farmers would bring milk in churns to the factory for use in the production of condensed milk. The artwork features a farmer lifting a heavy churn and also 2 separate churns. The piece is life sized and weighs just over a tonne. 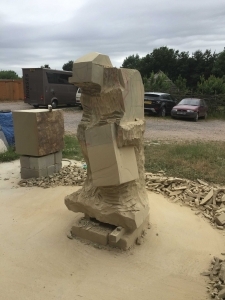 The Derbyshire sculpture will be installed prior to an event to open the sculpture trail in Hatton in October. Also during the project we have run a series of stone sculpture and drawing workshops with the community and a local school. Images of these can be found on my previous post.